25 Response to "Matthew McConaughey & Jennifer Garner Are Here"
My mom is the head designer at Yum Bunnies Cakery in Belmont. Yesterday, they just delivered 4 massive wedding cakes to the big mansion in Needham for a scene. That's great news. Good to hear that local businesses are benefiting from the all the movie productions. Yum Bunnies Cakery must have great cakes. I've never been, but I'll be sure to check it out. I heard he may be in Randolph this week, anyone else hear anything about that? 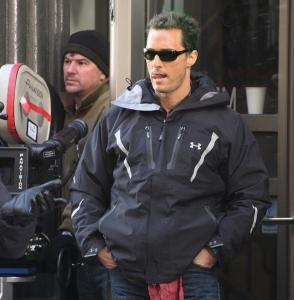 I saw Matthew, Jennifer, and crew filming on Thursday night (4/3) on Marlborough Street in Back Bay. The whole block was lit up and they were filming in front of a brownstone. Autumn-colored leaves were attached to the leafless trees to create a fall setting for the scene. The crowd of onlookers (mostly neighbors) was very controlled and we were allowed to get pretty close to the filming area. Does anyone know if they'll be filming in this location again? OMG are they still filming in sudbury?????? I was waondering if anyone had any info on where Matthew Mcconaughey..(ghosts of girlfriends past) might be filming this week??? I just missed them in Sudbury..:( I am a true fan of Matthews and have been for quite some time..I would love to be able to get just a glimpse of him at work..It would be so exciting for me..so any info would be awesome. who is filming today by the public gardens on Charles street? does anyone know if they are filming today and where? I think they are filming on West Street tomorrow at night time. If iI am right they are filming in Lowell, been driving buy the cobblestones resteraunt where there at. It looks like they are filming again today in Sudbury at the Wayside Inn. I'm pretty sure I spotted Jennifer Garner as I drove by. They were filming last night in Salem at the Peabody Essex Museum.